You’ve made the decision to buy a portable weather station. And you want the best possible handheld device that will serve you for years. Don’t worry, we’ve got you covered. In our article you are going to find a detailed comparison of several high quality weather maters worth buying. All form different price ranges and with distinctive characteristics. Please check the comparison table or head down bellow to find out more about them. Weather is important factor for variety of outdoor activities. And as we all know, activity means – movement. And when you move, the device must be portable. That’s why buying the best handheld weather device is so crucial. The digital pocket station is perfect for people who rely on accurate weather data, while practicing their work or favorite outdoor activity. It is a great add-on to the arsenal of any wind surfer or sailor, and a helpful instrument for the firefighter or storm chaser. These are some of the few possible used cases of one such instrument. Check out if it applies to you. Car racing relies heavily on weather. Small changes in pressure, temperature, and even altitude, can cause serious disadvantages, and affect the outcome of the race. That’s why a portable weather stations is the perfect tool for tracking weather changes along the track. This will help you take the pest possible decision during the race. Hunting and long distance shooting are highly dependent on wind and density of air. If you soot beyond 1000-yards a handheld device will provide tremendous boost of accuracy. Some of the devices list here has Bluetooth capability – perfect for pairing with plastics calculator. The hunters will like the night vision feature. First responders must be fast and mobile. They must know the exact weather conditions in the area of operation, to keep them self away from dangerous situations. That’s why easy to use, rugged weather logging systems is so helpful. Because when they are saving time they are saving lives. Fishing needs favorable weather condition. Because fish is so sensitive to changes in barometric pressure, knowing the exact variables is increasing the odds of caching one. For example low pressure and light wind can draw the fish to surface to eat. Sometimes backpacking and camping is activity of higher altitudes and bad weather. Sudden drop in pressure or change in wind direction can bring bad conditions and ruin your day. In situations like these, making the right steps is important. When in doubt, use your portable device to collect data and take action. Today, many seek the thrill of observing severe weather in action. While caught up in the excitement, people take unnecessary risks and create dangerous situations. Knowing the exact conditions around you will give great advantage while chasing storms. Firefighting, EMT, and HAZMAT teams often find themselves in situations where accurate environmental information like wind speed and wind direction, temperature and humidity is a must. These kinds of device are the perfect tool for gathering all the necessary info before deploying the essential equipment. A typical handheld device consists of a couple of electronic sensors combined in small compact box. All of them have anemometer to provide the necessary information about the wind. And to show you how much and form which direction the wind is blowing. Now you will know if there are any regular gusts or the wind blows steady from north. Besides the anemometer it may also include a multitude of other sensors and features – absolute and relative air pressure, weather forecast and compass calibration, humidity levels, air temperature, and dew point. Combined, all this features and sensors make a true pocket weather instrument. Researching and buying one is not an easy task. There are lots of device with price ranging from $16 to $400. That’s why out guide presents the best meters from different price ranges, and with different functionality. 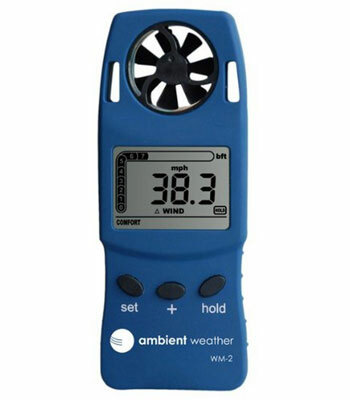 The Ambient Weather WM-2 is well build portable weather station. It has all the basic functionality typical for this kind of devices. With small and compact dimensions it will be a convenient travel companion. Just put it in your jacket and you are good to go. You’ll have no problem navigating through the devices’ functionality. It is quite easy and intuitive. The display is functional and presents the data in a convenient and easy to read manner. Because it’s a low priced model – WM 2 has just the bare minimum of features. 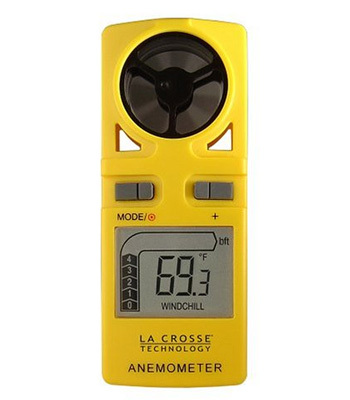 With this weather meter you will be able to track the surrounding wind speed and temperature. The speed turbine is securely mounted on to the unit’s body, and gives the reading instantly. It is capable to withstand wind speed of up to 67 mph. The other main characteristic of this handled meto station, is the temperature sensor. It is placed inside the display and needs a couple of minutes to stabilize its readings. When it’s ready it gives the current air temperature and wind chill factor. The measurement units are bother Fahrenheit and Celsius, so you can switch to one you are most comfortable with. The device can change between all major units of wind measurement- mph, Km/h, m/s, ft/min and Knots, plus the current index on Beaufort scale. 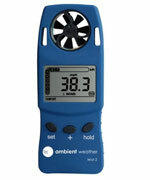 Another helpful feature is the capability of the WM-2 to record the average and max wind speed. One of the drawbacks is that it can be easily influenced by body heat or the sunlight. So keep in shade and don’t hold closer to the screen. The final feature is the backlight display, which is perfect for those nights out camping or hunting. Overall this is a quality instrument with accurate readings. This unit is the perfect tool for people who need simple portable weather station. Another perfect solution for people who need affordable pocket weather tracker. This time the instrument comes in a stylish weather resistant housing. And this makes this tool ideal for people involved in water activities. Things like surfing, kite-surfing, and sailing will be much more pleasant. The anemometer needs around 6 seconds to warm up its internals and star reporting the current wind conditions. The time of reaction is not great, especially for tracking wind gusts, but again this is just a basic model. 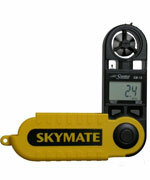 The wind tracker can report the wind speed in Knots, miles per hour, meter per second, and kilometers per hour. Like the previous model, this one also has the Beaufort scale graph. This gadget can withstand wind speeds of up to 67 mph, and track light air movement as low as 0.44 mph. The model has a standard temperature sensor capable to measure temperature between -21.8 °F to 138.2 °F with 0.2° resolution. The display is easy to read even in low light conditions because of the integrated back-light function. The EA-3010U is powered by 1 x 3V lithium cell battery (CR2032) with maximum life of 1 year. We recommend this model for people that operate close to water and need just the bare minimums of features. It is a great tool for the price. 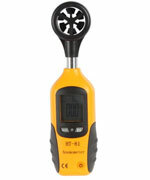 Let’s make a quick look of this anemometer/thermometer. A very similar to the previous two, OriGlam gives only the most necessary of sensors. On the matter of build quality – it’s sturdy, with nice hand feel and very well constructed. It doesn’t scream cheap at all. OriGlam uses 9 V battery to draw power from. The battery will keep you charged for at least 6 months. It is a very simple to operate – just press the on/off button and the device will start to read the temperature and display it at the top of the screen. You can do Celsius of Fahrenheit. At the bottom of the screen is the anemometer read out. You can set the device to work with several types of units – m/s, km/h, ft/min, knots, mph. You can either measure the wind dynamically or record only the min and max. The propeller uses fixed type axis of mounting, so it is not going to move depending from which direction the wind is coming from. So to get a good reading you have to point the device parallel to the follow. It will track wind speed form 2.24 to 56.00 mph. The build in thermometer will record temperatures form 32 F to 122 F.
This is a good system form home owners if they want to test the air flow and temperature coming out of HVAC vents. Another well made durable device with lots of positive feedback from various consumer sites. It is made from strong plastic material, and equipped with retractable lid (pocket knife type) to protect the screen and the impeller. When opened, the lid is giving you the option to place your hand further away from the temperature sensor. Convenient feature that makes sure there is no body heat involved when the thermometer tracks the surrounding temperature. The yellow case is water resisint and floats. But be careful because it’s not water proof. This mean – no submersion or the unit will die. The accuracy is good. The manufacture is promising no more than 3% error when measuring wind speed. The specification of the anemometer lists the lowest possible speed to be 0.5 mph and the highest- 99 mph. This is about 30 mph higher than the previous three models. This makes the recorder much more desirable for people interested in storm chasing. Wind speed is recorded on intervals – 5, 10, or 13 seconds. Most of the cheaper models have problem with how fast they measure the temperature. But not this one. WeatheHawk SM-18 reacts well to temperature changes and puts the data on the screen quite fast. It is accurate, has wind chill feature, and can be set to Fahrenheit or Celsius. A good, simple to use product, which will be useful to people involved in water activities. With all the previous devices having just the bare minimum of features, we are the point of our review where we look at something more professional and advanced. Device made for tracking more than just temperature and wind. The Kestrel 3000 is digital portable weather station designed to effectively track a big list of variables. The model can measure the actual, maximum, minimum, average values of wind speed, air temperature and humidity. This is the first device in our list that is fully water proof. When submerge it the will even give you the water temperature. The device is made from high quality material; it is well designed, and has high reliability. It scores additional points for accuracy because of the National Institute of Standards and Technology certificate. 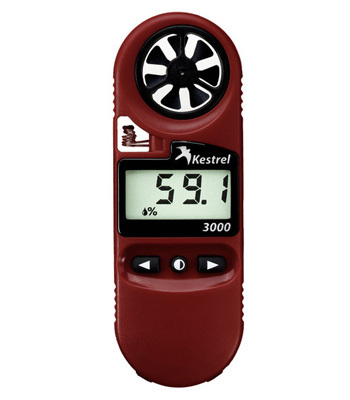 Kestrel 3000 can calculate the dew point and heat index – important information for people exposed to hot and humid conditions. The thermometer is located in a small opening below the impeller. It is fast, reactive, and you’ll be able to receive temperature data in a matter of seconds. 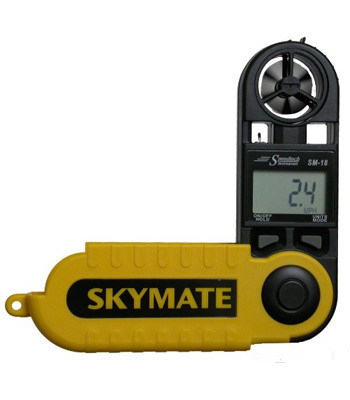 The anemometer’s impeller is sensitive and event the minor of air movement will spin it. The electronics needs around 3 seconds to calculate and display the data on the screen. A single CR2032 coin battery can power the device for more than two years. With this one, you get accuracy and multitude of sensors at very competitive price. 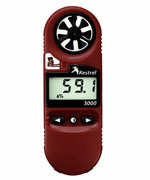 Kestrel have build a perfect tool for getting the right answers for the current weather conditions. 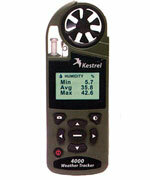 The 4500 is one of the most advanced portable weather stations manufactured by Kestrel. It has a large number of extra features, useful in lots of different area. 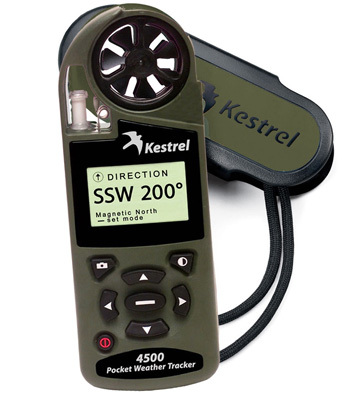 This pocket weather station is the one of the flagship devices of the entire Kestrel handheld line. It monitors the environment with one the most complete list of parameters – from temperature to barometric pressure, dew point, humidity, and wind. 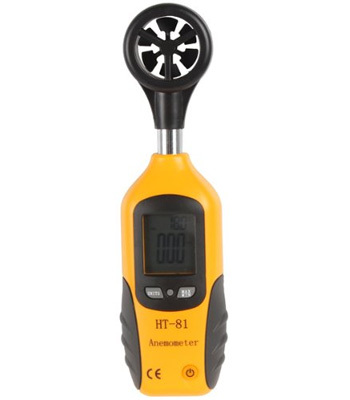 The anemometer is reliable, has replaceable impeller, and protection cap. It will track the current, maximum and average wind speed, wind direction, side speed, crosswind and tailwind. Operational temperature ranges are from -58 to + 122 ° F. This portable unit can operated outside of the claimed range, but you should limit the time of exposure. With the help of the barometer you will have access to barometric pressure, current altitude and density altitude. The 4500 NV uses a special highlighter, developed specifically for the requirements of professional soldiers. The main advantage is a special filter that reduces the overall brightness of the blue and green spectra for a better experience at night. It should be noted though that the backlight is not compatible with night vision devices. Another useful feature of the display is the data graph representation . It is powered by 2 AAA batteries that will provide continuous operation for over 2 years. The automatic shut-off function is adjustable and can be set between 15 and 60 minutes. It’s one of the few meters on the market able to transfer data to a computer. The feature is available only if you have Kestrel Communicator – a wired interface purchased separately. The program provides a long-term data storage, graph view mode, and real-time measurements. All these useful features makes this the perfect tool for variety of activities – professional and recreational. The Kestrel 4500 is the ideal choice for hunters. Thanks to features such as measuring wind direction, speed and lateral head wind to calculate the trajectory of the bullet. For tourism and leisure. Features such as pressure and relative humidity will help you determine the weather in advance. The built-in high-accuracy digital compass tuned to be helpful with many outdoor situations. The large number of advanced features, and affordable price, made the 4500 a popular item among scientists, that don’t need complex expensive equipment for weather forecasting. Special illumination preserving the ability of the human eye to see in the dark without re-adaptation, invisible to the naked eye from a distance. Impeller (anemometer module) can be replaced without tools. This instruments will be useful to those who are involved in weather forecasting, construction of road and buildings, rescue services, rescue workers, pilots of small aircraft, hunters, sailors, and many others.